Caring about developing our ranges while the agricultural world is changing, EUROMARK conceived a small volume straw blower, with as much performance as big machines : the BOOSTER 2D2. With its small size and its long-thought conception, BOOSTER 2D2 small volume straw blower brings you maximal efficiency with minimum clutter. EUROMARK furnished this model with two S.D.E. mechanical separators equipped with 40 sections each; this Strung Bale Distribution ensures you a quality mulch and gives the seperators high performance for all fodders. With a 2.8m³ useful capacity, its tank has been conceived for all bales (round : ± 2m of diameter and square : ± 2m50 of length). With great adaptability, double-seperators small volume BOOSTER 2D2 is available in various versions in order to fulfill all your needs and fit in every building. Or in POLYFLOW central chute version. 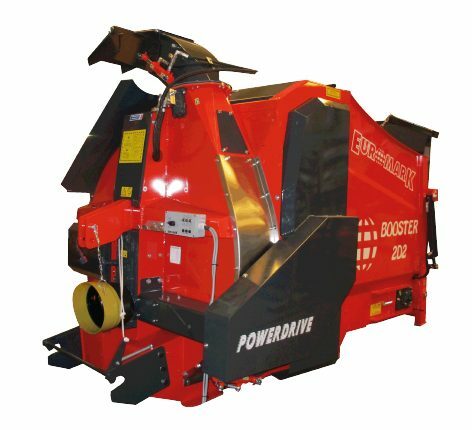 To spread difficult products, BOOSTER 2D2 can be equipped with a carrying system by hydraulicly disengageable belt. POWERDRIVE system is an EUROMARK patented innovation (optional feature). Equipped with 2 S.D.E. mechanical seperators, BOOSTER 2D2 ensures a maximal yield, for all type of fodders ( hay, wrapped grass, short-strand fodder…). Adapted to an intensive use, Adaptés à une utilisation intensive, S.D.E. mechanical seperators are equipped with 40 cutting sections to distribute wrapping. Regular supply is ensured through all distribution thanks to the double flow turbine. All-fodder seperators are mechanically powered by a belt. With a diameter of 550mm, these seperators have cutting sections, which slice grass bale. Ejectors, spiral placed on the seperator, drive the products through the turbine. The seperator’s important diameter prevents long fibres from winding. A comb regulates the straw’s or the fodder’s flow into the turbine. Lateral chute, mulch between 18 and 20m far (depending on the straw quality). POLYFLOW central chute, mulch up to 15m far in hard-to-access areas (depending on the straw quality). Mounted version, to offer you all perks of an excellent manoeuvrability.